The broodwarmaps.net staff want to wish you all a happy, healthy, and peaceful New Year. Best wishes to everyone! Thanks to Freakling who mailed me about the issue, I asked my webhost to restore the backup of the files to my webspace, and he did it immediatly. So thanks to all-inkl.com. Unfortunatly, the newest backup was from september 16th, so some of your updates have been lost. The comments are up to date, though. It were only the files that were restored, not the database! I tried to improve the security by not allowing execution of .php files in /maps, /pics, but only time will tell if it helps. Oh, and the map \"GD_Clone\" that was here for a few hours was just me testing my changes to the scripts, in case you wonder. So you might be wondering, what happened to January's map of the month competition? Well, I decided not to host MOTM that month since bwm was fairly inactive at the time, and let the maps build up a bit so that February's competition was nicer, and to give me time to post the late MOTMs. Clearly that failed on both accounts. Despite that, we definitely have a clear winner this month, which blew the other maps out of the water as far as votes go. And here I present (2)Spider Monkey by sTY_leZerG-eX! This map is deceptively simple. From a glance there's not much to the map, but let me persuade you to believe otherwise! First thing you notice about the map is likely its symmetry. It has even symmetry along a line of y=(-x). More simply, it's a form of symmetry that can only be done entirely by hand: the editor is limited to even symmetry along the x or y axis, or odd symmetry along y=x (the most commonly used form in (2)maps). So keep that in mind as you examine the map: the editor couldn't simplify things here, it was all the mapper. So be on the look out for positional imbalances, or in this case, largely the absence of! The first part of the map, the mains, nats, island expo between them and mineral only expansion between them resembles very much half of (4)Python, though the mains and island area are much more spacious here. Additionally, the nat features a lowground "cliff", a piece of land annexed away from the nat itself where harass units can be dropped but who will gain no altitudinal advantage. The nat choke is fairly tight, which encourages fast expo-based play. The neutral mineral only expansion has 12 mineral blocks, but with three blocks having reduced mineral values, so it will fairly quickly decompose to 9 blocks. This is a lot for a mineral only expansion, which typically have 5 to 7 blocks max. This expansion is pretty undefensible, it's neutral in relation to distance between players so has no proximal advantage and is in the open, featuring no choke to defend. Will players attempt to take it for its mineral worth despite its great vulnerabilities? I think it's plausible, given another map feature. There is a clump of garbage in the center of the map which sort of divides the middle in half. I believe (but can't know for sure, the right position's bridge is a little high) that scouting pathing will take this side of the middle, and that because of the rest of the expo layout all other pathing will take the upper half. If this is true, then that neutral mineral only expansion can be ignored by the player who has a strong position in the upper half, enabling the other player to attempt to catch up via that expansion. The last part of this half of the map is the island, which is pretty spacious, features a lot of unbuildable terrain (for dropping on away from static defenses), and is blocked by a neutral sunk which blocks the hatchery as well. This must be destroyed and time given for the creep to subside. The author clearly doesn't want you to build your strategy around taking this expansion, and would prefer for you to take it only later in the game when both players are capable of fighting over it. Outside the natural we first encounter a very defensible 6-block mineral only expansion. The safe player will take this as his third, the somewhat less conservative player will take the next expanion: the third gas expansion. The third gas is defensible by ground, being fairly far from the opponent, and featuring a relatively tight choke, but is vulnerable to harass from the neutral-blocked cliff overseeing it from behind. The bridge mentioned earlier, which forms the shortest nat2nat path, will be behind most players' rallies I believe. Players I think are more likely to rally outside the third gas expansion, and thus defend both that and the mineral only expansion, while not being too far from the nat. The bridge will thus potentially be used for some forms of ground-based harass, likely involving zerglings or vultures (maybe dts), but probably won't be used much for army movement. This is the reason I believe the "lower" half of the middle will be largely abandoned, leaving the brave player to more safely take the neutral mineral only expansion. The last part of the map revolves around the temple layer in the "highest" part of the map. Three pairs of ramps lead up from the middle to this region. The side-most parts of the area is annexed off by a neutral xel naga temple and two stacked neutral power generators to form the third gas cliff. Most importantly is the neutral gas expansion in the farthest corner of the map, in a lowground off-shoot of this area. The expansion is semi-island, the small choke to it being blocked by a neutral xel naga temple, and then the expansion itself being blocked by a neutral spore colony. This creates an island dynamic between it and the full-island in the opposite corner of the map. Both fourth gas expansions are neutral islands, and it will be difficult to obtain this additional gas. Much of the game's play will thus revolve around mineral heavy / gas light units to conserve the precious gas. This is important, because in scenarios featuring mineral heavy units, the tightness of the map becomes even more important than usual: because the splash of the sparce tech will dominate mineral heavy units in a tight area, and be nearly useless in very wide areas. This map has a very wide middle, but features tight chokes everywhere else. Thus it's up to the players to carefully choose their battles to optimize the strengths of their units and minimize their weaknesses. Executionally the map seems very good. Stylezerg has believed off this symmetry very well, and it's not easy to do. Most mappers don't even bother attempting it. Even in the days of counting isometric squares for making a map symmetrical no one bothered with this form of symmetry (with notable exceptions, such as (2)paranoid android) because isometric squares going left/right and those going up/down aren't "equal" tile-wise, and thus merely counting left-right squares and replicating that on an up-down pallete will very quickly create positional imbalances. The only odd things I notice here positionally are the placement of the two bridges, and some ramp placements/angles, and those I believe are largely irrelevant. Thus, the most important stuff appears positionally balanced, nice job stylezerg! The last thing I want to say about the map is to point out how the map is balanced by a series of dynamics. The dynamic of "top" and "bottom" of the middle (top left and bottom right respectively) dominates unit movement and pathing, the dynamic of two neutral 4th gas expansions in each of these regions further plays upon that, the placement of the neutral mineral only does so as well. The map makes gas scare, and then makes sure to include a variety of areas in the map, some wide some tight, to enable the players to balance the gameplay based on their decisions. A dynamic unmentioned previously exists where every expansion safe by ground (featuring a tight choke) being easily harassed by some cliff-feature (with the exception of the mineral only, making it as I said earlier the conservative player's choice of third base, balanced by its relative unworth of only 6 mineral blocks and no gas), and the bases which lack such harass-elements are difficult to take (the neutral min only has no such choke, and no such cliff as well; the two islands are pretty safe as far as islands go additionally). Thus the gameplay being on dynamics emphasizes what I said initially, that the map is only deceptively simple, and is beneath the surface a very complex and dynamic map. Congratulations to sTY_leZerG-eX for his third MOTM ever, and first MOTM made entirely on his own! Don't forget to check out second place: (4)Asarin by neobowman! I don't write about second place maps with so few votes: like I said, vote-wise spidermonkey blew the other maps out of the water. I don't know if the statement better late than never is universally true or not, but at anyrate, this MOTM is certainly late and no longer never! Oro Lala1.2 by Razt has 30 points, and Junktion2.6 has 32 points. However, Nastymarine gave his own map 3 points, and I have always discounted self-votes in the past. Discounting those three would put Oro Lala1.2 in first place, by a single point. I of course have never had any scruples about changing my vote to manipulate which map is winning, and could change my vote to make either map win. Do I however feel strongly that one map is better than the other, to the extent that I should pick one over the other? Nope. Furthermore, is there a MOTM 1 competition at all? Nope. So how about both maps win? Nasty's map came first, so it's MOTM 12, and Razt's map is MOTM 1 for 2010. Junktion's most noteable feature is the layout focused around the natural expansion and 3rd expansion. The cliff overlooking the back of the natural expansion is blocked off on one end by a 2000 hp neutral, and on the other end by the 3rd gas expansion. The neutral is more easily clearable, which enables access to this cliff by ground (and thus makes harass at this location potentially easier to deal with). The 3rd expansion itself however is only accessible through a path that leads from the middle (if you want to use the gas, which you almost undoubtedly do), as opposed to some path leading directly from the nat, as is the standard. This leads to interesting cheese scenarios, where a protoss player for example could hop a probe over the 3rd gas expo's mineral formation, and place unreachable-by-ground cannons directly behind the expansion. Or perhaps a terran player could hop an scv across and make a factory, or make a factory outside and lift it in (the former protecting the building-worker from being prevented from finishing the construction, the latter making it more likely the scv will get back home) and construct tanks to hit the expansion from. 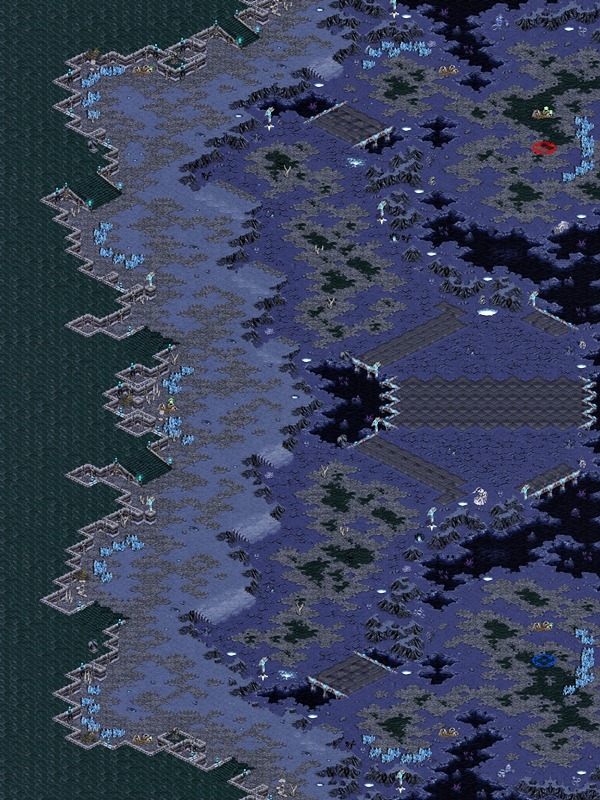 Additionally, vultures and burrowable zerg units (read: lurkers and potentially hydras) can hop over the formation to acess this cliff using mines and stacked burrowing respectively. There could be other ways to utilize this cliff without use of air, but I can't think of them. At anyrate, it leads to a number of interesting scenarios enabling the players to easily harass eachother in ways impossible in most maps. It clearly makes it imperative for players who seek to expand quickly to scout well and secure map control early to prevent this. The path leading out of the nat along the main pathing is tight after the nat, making it useable for early attacks and scouting only. Players will rally out the larger exit which heads out into a longer path later in the game. Near where players might rally is the 4th gas expansion, in the corner of the map. It's misleading to say that there are two paths that lead to this expansion even though that's the truth, because one path is needlessly blocked by a neutral, and is useless even without the block. I cannot think of a single scenario where you would be able to reinforce your expansion via the longer, tighter path if the shorter, wider path where you would be likely to rally all of your units to were inaccessible. This is somewhat silly and is part of what makes me not feel strongly about the map. The second path is more for the map's aesthetics than anything else, but uses up space, and includes a useless neutral block which seems again to be more for aesthetics than gameplay. Why bother with features like that? Two neutrals are on either side of the path that leads to the middle for large units and to the 3rd gas expansion, and one along with a neutral on the side of the small main-pathing ramp opposite the 3rd gas expansion create another semi-cliff which is inaccessible by ground until one of the neutrals is cleared. However, this cliff oversees absolutely nothing. I can't even see it being used in a tvt, where drops and the repositioning of armies is common-place. Another example of a silly useless space-wasting feature of the map. The obstruction itself is critical for the map's concept, as it increases the distance between players via the larger ramp path (which leads to the 3rd gas expo), but why it's a neutral blocked cliff and not say, a pretty lake or something that's more obviously useless is simply a matter of aesthetics. The 5th gas expo is off to the side of the clearing outside the 4th gas expo and the large ramp pathing. It has no noteable features aside from the relative vulnerability its wide choke yields. The only other thing I can say about the map, is that the expo I described as being the 3rd gas is potentially more likely to serve as your opponent's 5th gas, with the 4th and 5th I described being the 3rd and 4th respectively. However, the close proximity by air and nonfavourable if not close ground proximity to the opponent makes this unlikely. Particularly as the cliff overseeing the natural can easily be used against this, especially once the neutrals are down. So here we have a decent map, with some interesting features, and some silly features. I like the use of the small ramp for the main scouting pathing, and the large ramp to extend the distance between the players via the large-unit pathing as a way to alleviate the linearity of a two player map, as well as the concept of a cliff being potentially used against two different expansions. However other aspects of the map mar it conceptually to me, such as the useless paths and cliffs formed by useless neutrals, and the difficulty in putting what I described as the 3rd gas expo to any practical use, given how far away it is from the large unit pathing out of the way (from your reinforcements), and its proximity to what I described as the opponent's 5th gas expo. All-in-all the map isn't bad, but it just isn't great. There's nothing that makes me love the map, but there's nothing also that might make the map bad. There are however certainly things which potentially make the map's gameplay awkward, such as the difficulty of placing buildings effeciently defensibly in the natural as part of a fast expand build. Despite this, its execution and concept are above average, so to describe the map as being average would not only be an insult to Nastymarine, who is a good and talented mapper, but would additionally simply be inaccurate. I can thus only describe the map as being "interestingly decent". Aside from RazT's map, it had no other competition, so relatively it blew the other maps out of the water, and thus deserves its place as MOTM. RazT is an unknown mapper here: this map is his only contribution under that name at this website, so it's remarkable that it should win a MOTM. Congratulations RaZt! The map uses a simple even symmetry, being symmetrical along a horizontal line that splits the map in half (symmetrical like the letter 'K') Typically two player maps use odd symmetry, with f(-x) = -f(x) (symmetrical like the letter 'S'). There are three main paths. The main pathing takes the second path at first, and then potentially the first second, and never takes the third. The first path is lowground, and connects the two natural expansions. The second path is highground and contains every expansion past the natural, and cliffs the natural somewhat. A multitude of ramps lead from the first path to the second. Near the middle of the map the main pathing becomes ambiguous, as the first path goes around a curve, making the shortest path a mix of the first and second path. However, starcraft pathing dictates that units are afraid of ramps, and thus units will potentially take a somewhat longer path if it doesn't change altitude. This is potentially but not always the case in this map. The third path is higher than the second, on a high basillica level. It cliffs every single expansion past the natural. A smaller multitude of ramps lead from the second path to the third. The expo layout is relatively simple. Past the nat is the third gas, which is comfortably close in proximity to the natural. Past that is a mineral only, which functions as the fourth expansion. Past this is a neutral fourth gas expansion. It's the least vulnerable of the second path expos to the cliff, but most vulnerable to ground (it's more open). Players will be able to easily fight over this expansion. The expo layout yields 3.5 geysers per player, below average. Typically, two player maps have four or five geysers per player (bluestorm has four, destination has five, for example). The linear progression of each expansion along the map's space along the same path enables players to change their rallies everytime they expand. This is extremely comfortable, but tends to lead to turtlish gameplay, hence the third path. The dynamic between these three paths is key to the map's gameplay. Players can constantly weave between each path to avoid and outmaneuver their opponents. That the third path cliffs the expansions offers each player easy ways to harass their opponent in addition to simply moving around between the paths. The first path further opens up maneuvering as a viable option (as opposed to simply move forward or retreat). This great harass potential and great maneuverability potential strongly contrasts with the turtlesque gameplay of the expansions. This dynamic is further complemented by the below average quanitity of gas per player, which makes turtling as oppose to actively fighting over the gas less viable. All-in-all I'm convinced the map very well constructed to provide a specific gameplay experience. The map is well-made, the concept seems executed nicely, and it's aesthetically very well done. So why then, having said so many more nice things about this map than about Nasty's, was I unable to decide which was clearly better? Well let's get to this map's faults. The natural is atleast as difficult to properly build defensibly as part of a fast expansion build as Nasty's map if not more so. Honestly that's a big deal, having any kind of difficulty in securing the natural early on really potentially jeopardizes the quality of the gameplay. While there is a lot of harass potential by ground, the pathing and layout basically eliminate harass potential by air, cutting away a variety of strategic options. Limiting strategic diversity is usually a bad thing in my eyes. It's very easy to guard every base by ground from any air aggression, even against tactics as early as basic muta harass in zerg vs terran. Lategame drops and recalls are a key aspect to every matchup aside from zerg vs zerg, and those are all very difficult given that the pathing takes up 100% of the space. Finally, there's the issue of the first path around the center. The obvious main pathing splits here between the first and second path. This isn't bad, though it can lead to accidental base trades via the even paths issue. The problem however, lies in the ridiculously large size of the first path around this bend. It is single handedly the largest allocation of space in the entire map, larger even than the mains. And what's there to justify this much space? Nothing. The main pathing doesn't even necessarily take this path. It's too large to justify it with "adding maneuverability". There's no expansion to fight over here. No reason to rally here. 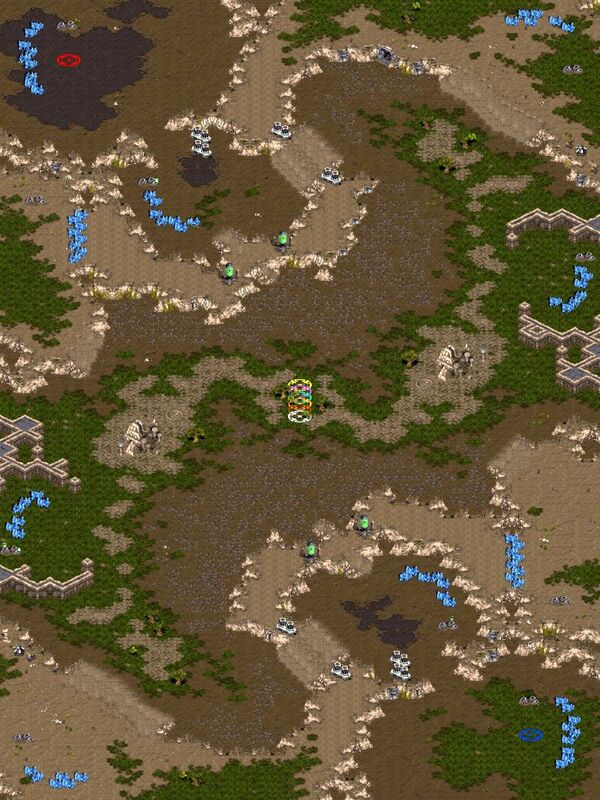 There's really no reason to be here, everywhere else in the map is more strategically valuable. As an alternate path and a source of nonlinearity/maneuverability the path itself is a valuable part of the map conceptually, but it doesn't need to be this wide! In fact, cutting it in half would help the map in a lot of different ways: it would reduce the amount of space the area currently wastes, freeing up room for air pathing. Adding air pathing would actually be a far more efficient use of the space, as ironic as that sounds. Doing so would greatly increase the air harass potential, greatly increasing the map's potential strategic diversity. This would even further combat the turtleish nature of the map's relative linearity, further improving the map and its gameplay. Alternatively, this space could be improved by instead adding another neutral gas expo. This would make the space useful, and decrease linearity by creating something important to worry about in this side of the map (in this portion of the path). This would do nothing for the air harass potential, but that's not inherently bad, as limited air harass potential simply seems to be part of the map's concept. I can't say for sure which idea is better, though I think I'd be tempted to favour the former. Adding an expansion to the pretty scarce expo layout certainly wouldn't hurt the map though. Room for improvement aside, this map is pretty good, and is amazing for someone who hasn't uploaded any other maps. Definitely worthy of MOTM in my opinion. Rumor has it: MOTM 2.2010 coming soon to a theatre near you! OK, FIRST SCAN YOUR SYSTEM BECAUSE I CAN PICK YOU UP ON MY EXPLOIT SCANNER!! FIRST TIME I'VE HACKED YOU, SO IT PROVES YOU'VE HAD MORE HACKERS BYPASS IT IN THE PASS. I'M WILLING TO HELP YOU SOLVE THESE ISSUE'S, I'M NOT LIKE THE KIND OF BLACKHAT HACKER LOOKING FOR DATA AND/OR HACKING SITES FOR FUN. I'M DOING IN FOR YOUR SAFETY.